- On the Mass of the Presanctified. - On the 1955 “Solemn Liturgical Action” of Good Friday. - On the ceremonial aspects of the Novus Ordo Good Friday Ritual. 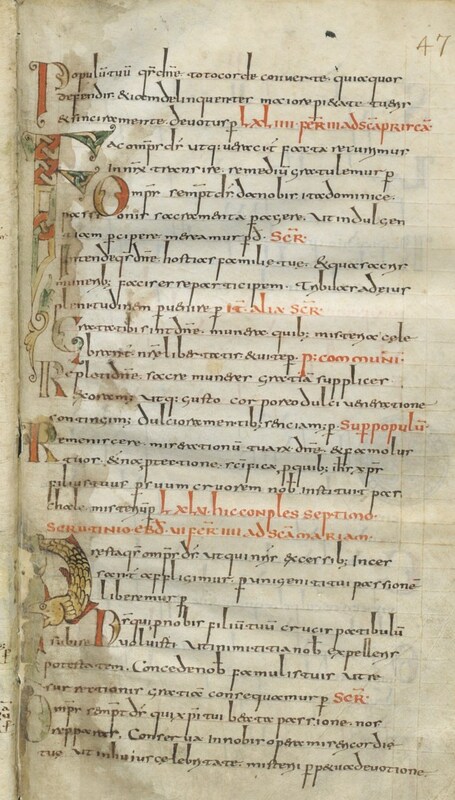 The Gelasian Sacramentary has two prayers for the Mass of the Catechumens on Good Friday; the first of these is the one found in the Missal of St Pius V, “Deus a quo Judas…”, also said at the Mass of the Lord’s Supper. (The use of the same Collect on both Holy Thursday and Good Friday emphasizes once again an important theme of the ceremony, the union between the Last Supper and the Sacrifice of the Cross.) The second prayer, “Deus qui peccati veteris”, had mostly dropped out of use by the time of the Tridentine reform, although it was still included in a small number of local missals even at the beginning of the 16th century. It was added to the beginning of the rite in 1955, but with a ritual different from that of the Mass, and different from what is attested in the ancient sacramentaries and later missals. In the Novus Ordo, the ancient prayer “Deus a quo Judas…” is entirely suppressed from both days, and “Deus qui peccati veteris” is given as the second of two options on Good Friday. 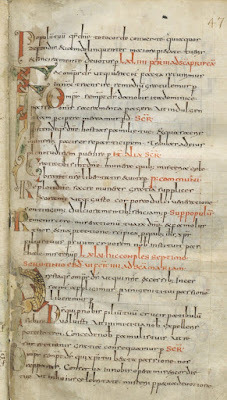 The first option, “Reminiscere miserationum tuarum…”, is in the Gelasian Sacramentary as the Collect of Holy Monday. The 1955 Holy Week had incorporated it as one of the three Post-communion prayers of the Solemn Liturgical Action of Good Friday; when the decision was made to return to a ceremonial order more in keeping with that of the Mass, the prayer “Reminiscere” was moved to the beginning. By some miracle, the text of both of these as given in the Missal is very close to that actually found in the Gelasian. The post-Conciliar reform specifically suppresses the word “Oremus” before the opening prayer, whichever one is said, and ends it with the minor conclusion, an unfortunate carry-over from the 1955 reform. The ancient lectionaries of the Roman Rite are uniform in assigning two readings, Hosea 6, 1-6 and Exodus 12, 1-11, before the Passion of St John on Good Friday. It is supremely ironic that the two readings on this day, together with those of the Wednesdays of the Embertides, of the fourth week of Lent, and of Holy Week, were routinely cited as evidence for the incorrect theory that the Roman Rite anciently had three readings at every Mass; ironic, because not a single one of them was left in its traditional place in the new lectionary. St Jerome begins his commentary on the Prophet Hosea by saying “If we need the Holy Spirit to come to us when explaining any of the prophets, … how much more must we pray the Lord (to help us) in explaining Hosea… especially since he himself attests to the obscurity of his book at the end, where he writes, ‘Who is wise and shall understand these things, intelligent and shall know them?’ ” Such a mysterious book is eminently appropriate for a day of such ineffable mysteries, when the Church stands present at the death of the Creator Himself. “... He will revive us after two days: on the third day he will raise us up, and we shall live in his sight. We shall know, and we shall follow on, that we may know the Lord. … For I desired mercy, and not sacrifice: and the knowledge of God more than holocausts.” This is explained by the words of the Tract which follows, taken from Habakkuk 3 according to the Old Latin translation of the Septuagint: “O Lord, I heard Thy report, and was afraid: I considered thy works, and was amazed. Between two living creatures Thou shalt be known”; the “two living creatures” were first understood by St Augustine to be the two thieves crucified alongside the Lord. Thus the Tract shows us that we attain to “the knowledge of God” in beholding the Crucified Lord. And likewise, as Hosea says “For I desired mercy…”, the Tract says, “in wrath Thou shalt remember mercy,” an expression of the idea, “a scandal to the Jews, and foolishness to the gentiles,” that God’s supreme act of mercy was to undergo His Passion, in the very midst of which He prayed for the forgiveness of those who inflicted it upon Him. 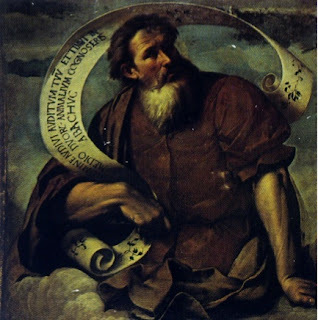 The Prophet Habakkuk, by Girolamo Romanino, from the Sacrament Chapel of the church of St John the Evangelist in Brescia, Italy. (1521-4) The quotation on the banderole, of the opening words of the canticle, follows the Old Latin text, which was translated from the Septuagint, rather than the Vulgate version of St. Jerome. The second reading from Exodus 12 describes the slaying of the Paschal Lamb under the Old Law, which was of course taking place in Jerusalem even as Christ was undergoing His Passion. This choice is grounded in the Christian understanding of Jesus as the Lamb of God who takes away the sins of the world, of whom St Paul writes, “Christ our Pasch has been sacrificed”; but also in the very nature of the ancient Good Friday ceremony, the vivid representation of the death of Lord, for which we are truly present. In the new lectionary, this passage is removed to the Mass of the Lord’s Supper, an expression of the equally important point that the Lamb was sacrificed not merely to be sacrificed, but to be consumed. It is replaced on Good Friday by a passage from Hebrews, 4, 14-16 and 5, 7-9, on the priestly offering which Christ makes of Himself in His Passion. The first part of this is read at Tenebrae of Good Friday; per se, it is a perfectly reasonable choice as an Epistle, though also a very obvious one. Traditionally, the reading from Exodus is followed by a Tract from Psalm 139, a text long associated with the Passion of Christ. In the official Ordo Cantus Missae, it is replaced by the famous Gradual Christus factus est, formerly sung on Holy Thursday and at all the Hours of the Triduum, another very obvious choice. The fact that the new order of the chants, tract before gradual, is completely contrary to the tradition, is mostly beside the point. It is impossible to escape the impression that the reformers felt a strong need to make everything as obvious as possible for the “benefit” of a Catholic laity which they saw as otherwise completely uneducable, unable to endure anything mysterious, complex or lengthy, even when celebrating the deepest and holiest mysteries of our redemption. The Passion of St John is left undisturbed; blessedly, an alternative shorter form of it is NOT given, as was done for the Synoptic Passions read in the three-year rotation on Palm Sunday. In regard to the Solemn Prayers of Good Friday, no less a figure than Abp Bugnini himself expressed in his memoire trepidation at the idea of altering such an ancient and venerable series of prayers (La Riforma Liturgica, 1948-75, p. 130), although this did not in the least stay his hand from altering them; they are simply too laden with ideas that Modern Man™ finds unpalatable. A single example may suffice to demonstrate the tenor of the changes. The first invocation traditionally reads in the Missal of St Pius V, “Let us pray, beloved unto us, for the Holy Church of God, that our God and Lord may deign to grant Her peace, unity and protection throughout the world, subjecting to Her principalities and powers, and grant us, as we live a quiet and peaceful life, to glorify God the Almighty Father.” (These texts are substantially the same in all the ancient sacramentaries.) In the 1970 revision, the words “subjecting to Her principalities and powers” are of course suppressed. All of the prayers now end with the short conclusion. Two very peculiar and wholly unnecessary ritual changes are also introduced. The invocations, which were always sung by the celebrating priest, are now to be said by a deacon or layman. This is contrary to the universally attested tradition of how the prayers were done, but wholly in keeping with the modern rite of Mass. Where each invocation was traditionally followed by “Oremus. Flectamus genua. Levate.”, “Oremus” is now suppressed, and “Flectamus genua. Levate” are made optional. The blight of optionitis must cover all things, and this rubric is followed by another which gives local episcopal conferences the possibility of adding their own intercessions, while another permits the same “in case of grave public necessity” (undefined) to individual bishops. The tedious subject of the prayer for the Jews has been rendered all the more tedious by the bad-faith efforts to use it as a weapon against Pope Benedict XVI and the motu proprio Summorum Pontificum, and I have no intention of addressing the matter here.